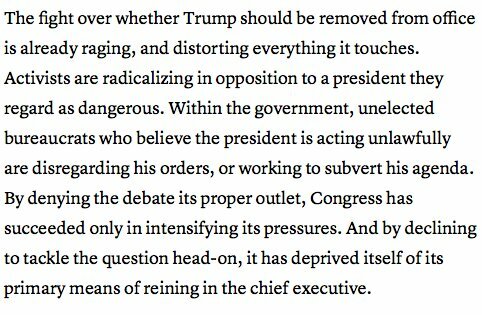 Thread by @RandyResist: "Trump’s bipartisan critics are not merely arguing that he has dishonored the presidency. The most serious charge is that he is attacking the […]"
But this sort of vote-counting, in any case, misunderstands the point of impeachment. 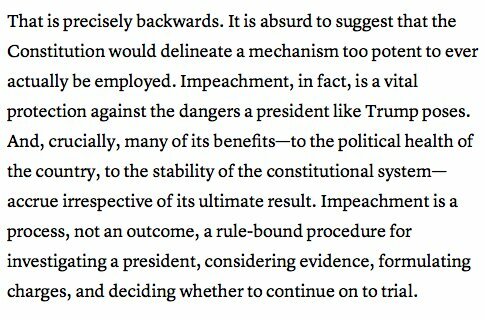 The question of whether impeachment is justified should not be confused with the question of whether it is likely to succeed in removing a president from office. Why? I quoted article. Well worth the read. •Trump’s trade barriers have increased manufacturing costs, closed off markets and clouded the future for American firms with global supply chains. •Economists say Trump’s trade war is the biggest threat to the U.S. economy in 2019. 1. It’s not too early. It’s what the Constitution demands. 2. Impeachment is a process, not an outcome, a rule-bound procedure for investigating a president, considering evidence, formulating charges, and deciding whether to continue on to trial. 3. By refusing to act on impeachment, Congress has allowed the pressure to build, and it’s distorting every part of the system. Unelected bureaucrats are disregarding the president’s orders; courts are striking them down. The damage to our institutions is mounting. Immigration enforcement has been handed over to a small clique of militant anti-immigration wonks that - this group knows that the best strategy for accomplishing its goal of driving out undocumented immigrants is quite simply the cultivation of fear. The “Golden State” Goes Brown. 1. California isn’t just a place, but a dream. 2. In the American mythos, California represented the end of the journey, the land where the dispossessed & forgotten could start again, where “Okies” who fled the Depression searched for relief & veterans of the WWII discovered a middle-class paradise. 3. And what’s most incredible is that, for a time, that is exactly what California, USA was for so many American Citizens.